It’s been almost a month since my last post – the longest break I’ve had from Feast Wisely since I started my blog three years ago. During this break I travelled to Malaysia to join my husband on a work trip, and then attended two conferences back home in Sydney. One conference was on corporate health & wellbeing – something I’m super passionate about after taking on the role of wellbeing champion for my team at work. But, as of today, I’m back to my normal routine just in time for the start of Summer. Speaking of routines I’m a creature of habit when it comes to food. Most of the time this is a good thing, because I religiously follow healthy habits, like cooking lots of nutritious, mainly vegetarian, feasts. But the downside of my food ‘discipline’ is that I’m not so experimental when it comes to eating out. I generally stick to a few trusted local restaurants where I struggle to venture beyond my favourite go-to dishes. But, the recent arrival of lighter nights (‘daylight savings’ for those of you in Australia), prompted me to try somewhere new. A local restaurant called August The Old Place. Their hearty wholesome menu, coupled with the short walk from home, tempted me out of my eating out comfort zone. 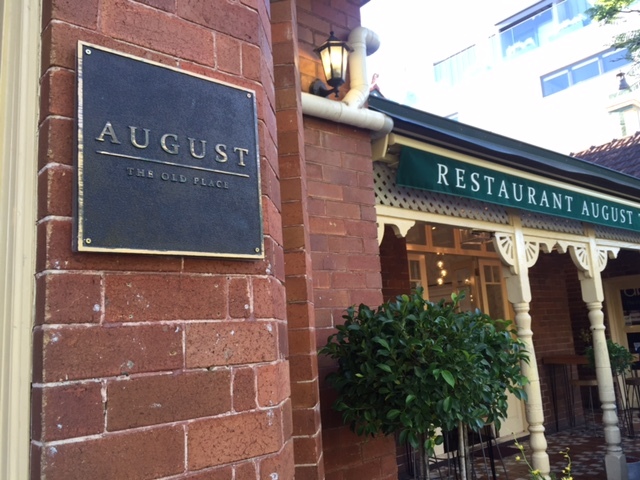 August The Old Place sits on a corner block in the heart of Mosman village. It’s got immediate curb side appeal, being located in a historic 19th century building with a sunny al fresco terrace out front. Inside is equally inviting – with features like antique tiles, original fireplaces and high ceilings. 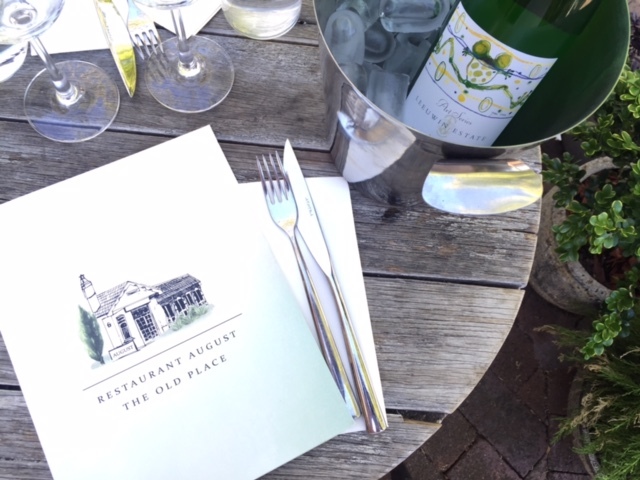 When it comes to feasting (or snacking) you can dine all day at August The Old Place – a full menu is available from 8am to 5pm, with extra lunch options from 11.30am. From 6pm a separate dinner menu is served. The wine list is reasonably priced but they also offer BYO wine for a small corkage charge – a good reason to take a special bottle. 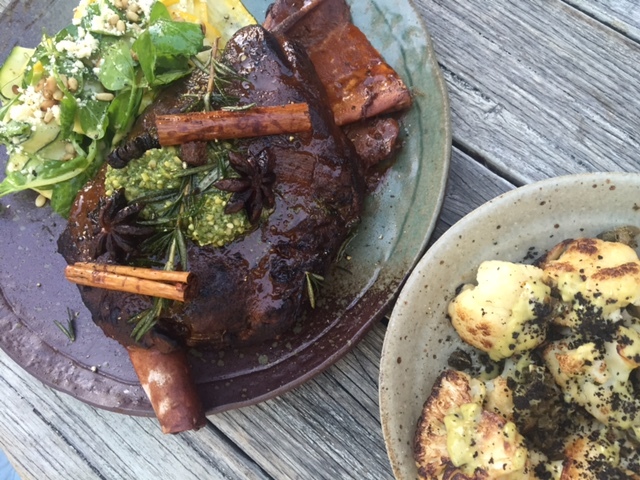 For dinner you can graze on shared plates or opt for a more conventional main dish with sides. After reading reviews that raved about the taste (and size) of the slow cooked lamb shoulder I’d pretty much decided on the lamb before arriving….a choice that only left room for a couple of side dishes. And although the lamb was great it was one of the sides – the pumpkin, or butternut squash, that most impressed me. It’s rare to find a side dish that is worthy of being a main course but this one is. 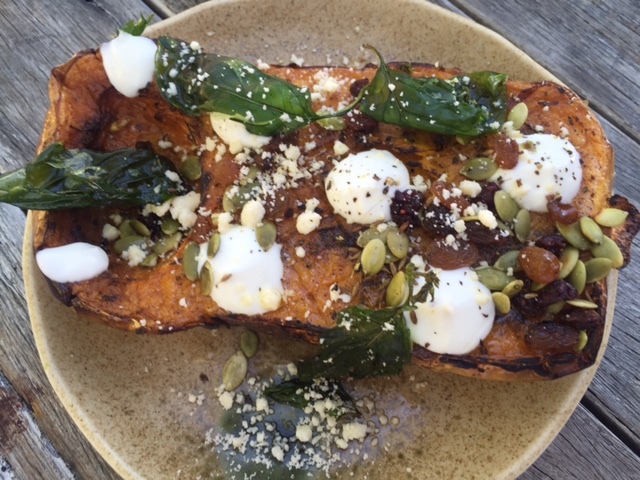 The roasted butternut squash ‘boat’ comes topped with goats cheese, yoghurt and pumpkin seeds – it was so good it almost overshadowed the lamb. Within days of my dinner I was experimenting with butternut squash boats at home….. 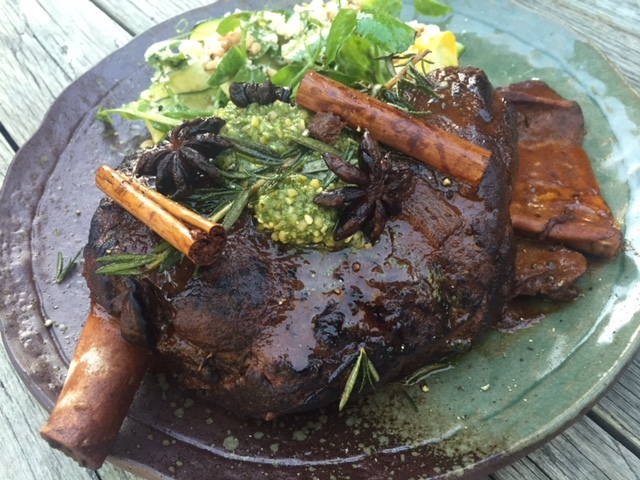 The lamb shoulder is slow cooked in Middle Eastern spices, like cinnamon and star anise, and is served with a shredded zucchini salad. After 13 hours of slow cooking it really was ‘fall off the bone material’. In my move to being pretty much vegetarian the lamb hit the mark as my monthly meat indulgence. Although not as impressive as the butternut squash a side of roasted cauliflower balanced out the meaty lamb and turned the dinner into a generous feast. 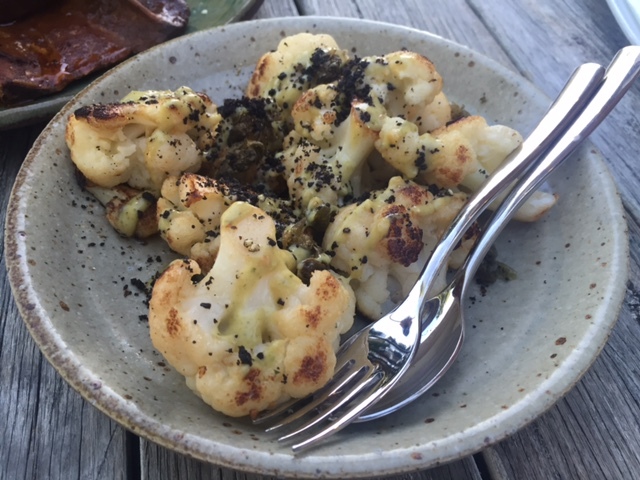 As I said at the start of this post I’m a routine kind of foodie when it comes to eating out. But my dinner at August The Old Place reminded me that sometimes it’s good to step outside of your comfort zone and try somewhere new……even if only once in a while. 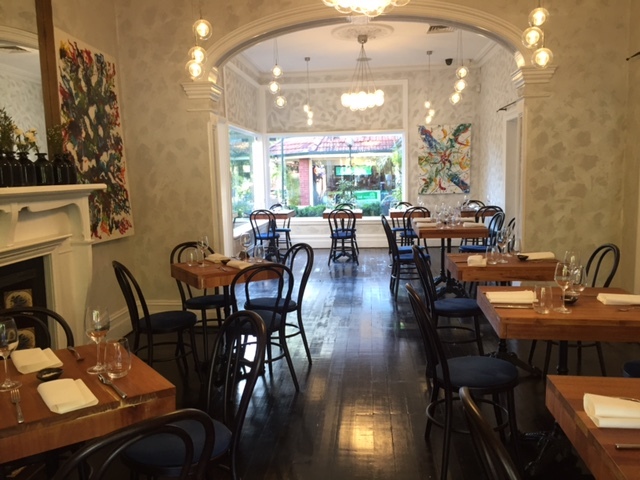 Tags: August The Old Place, BYO, mosman, restaurant, review. Bookmark the permalink. Thanks Nandini – that wasn’t my intention but shows how hearty their food is! Very exciting Marisa you must let me know if you’d like any tips! Yes I agree although I do have friends who try new places at the drop of a hat as they say – I’m more of a researcher for fear of having an average experience! This looks like my kinda place! That pumpkin looks delectable, I love the decor, and BYO to boot?! I gotta get there! 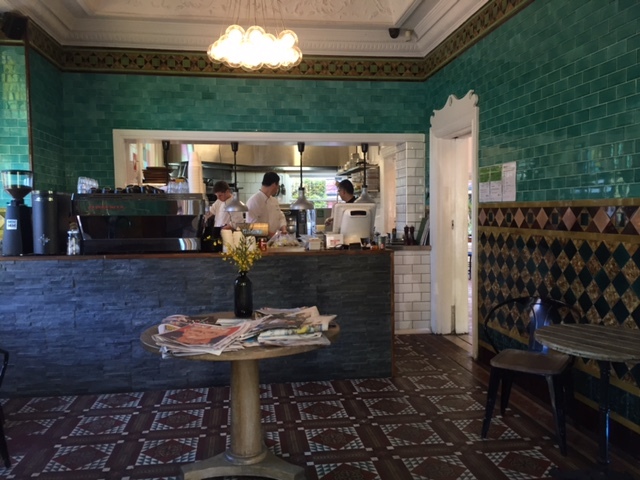 Yes Hungry Mum – and it’s a convenient spot if you’re ever on the way to or from Taronga Zoo as they serve food all day – let me know if you make it! Thanks! Yes it was – one of my foodie highlights from late 2016!